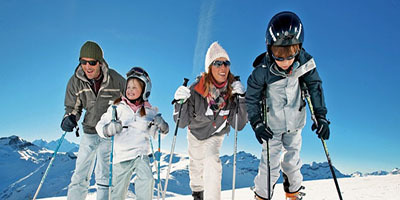 With its reputation for boozy après ski and table top dancing, families with children would be forgiven for thinking that St Anton is not a particularly family friendly resort. Whilst this may be partly true, the fact is that these days the resort is coming on leaps and bounds regarding its suitability for families and children, and it’s worth considering the pros and cons. Over on the Nasserein side of St Anton you’ll find a peaceful haven a world away from the bars and clubs of town centre. The Nasserein area has its own selection of ski hire shops and other resort amenities, and the Nasserein gondola is close by offering very easy ski access indeed. The best learner slopes in the entire resort are also located in the Nasserein area, and this is where the nursery slopes are located. There’s a ski school meeting point here as well, making things very easy for families keen to experience this iconic resort with children in tow. More recently too, some UK tour operators working in St Anton have started offering chalets and hotels with in-house childcare add-ons available. Parents can book the children in to lessons in the morning then either pick them up at lunch or book them into afternoon child care. It’s hassle-free, the children get a wonderful day of skiing and playing with new friends, and parents get to enjoy the slopes together in peace. All these things, along with the fact that St Anton town centre is car free and therefore safe for children, combine to make this iconic Austrian resort well worth considering for families heading to the snow. Ultimately however, compared to many other resorts the learner slopes here are limited so do bear this in mind. Found 70 results matching your search.